Who Elsa? : Storytelling opportunity -- Story Slam! Storytelling opportunity -- Story Slam! 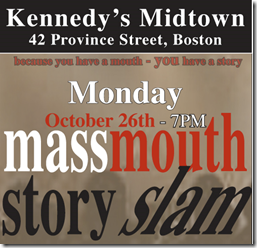 MassMouth is hosting its first story slam on Monday, October 26th! Just in case you need a cue, this is EXCITING; You should very much want to participate. If you’re too scared to tell, then you’re in luck: this month’s theme is “scared to death”. (Telling is not a requirement.) If you’re interested, you can join a judging team! All are welcome to listen. What is a story slam? A story slam is a contest. Known and undiscovered talent sign up to tell stories that will be scored by a panel of judges. Highest score = winner. How will this story slam work? On the night of the slam, folks will sign up to tell a 5-minute short story on the designated theme. The theme for October 26th is "Scared to Death”. Each story will be will be scored based on how well it is constructed, honors the time limit, and relates to the designated theme. On top of applause and recognition, winners will be awarded prizes! 5 minutes - 5 minutes means...5 minutes. You loose points if you use the 60 second grace period to wind up. Real stories? - Real stories have a beginning, middle and end. And they have a point. You are clear about why the story is important to you and why you want to tell it. Retelling any folktale, myth or fable is fine. No retelling of literary works ( copyright laws apply and this it is storytelling NOT recitation). No poetry unless the poem is original, is 5 minutes long and tells a story . Presentation - Your story presentation is important. It tells us why and how we should listen to you. Your voice and body are instruments of your art. You use voice, gesture and movement to the best of your ability in the service of your story. Practice - - You have to practice. One tip is memorizing the beginning and the ending words of your story by heart. It helps with confidence and focus. Practicing before a mirror, into a recorder, in the car when alone, in your head before you go to sleep or before you get out of bed - all help. Do at least some of these MANY times. You will be glad you did. Funny, Sad, Genuine - Funny is good, sad is real but all must be genuinely in service to the story. That is what makes yours a story worth listening to and sets it apart from rants, stand up and what you tell your therapist or best friend. Please make a point of attending if you can. For those of you who are interested in participating but are nervous – feel free to contact me via email (my email address is on the right hand side of this website) or by commenting on this post. I will happily answer any questions you might have and encourage you to join in on the fun. Yay Elsa - thanks for passing this on - I am so excited we are finally getting this idea into the world. Who Elsa? by Elsa Zuniga is licensed under a Creative Commons Attribution-Noncommercial-Share Alike 3.0 United States License. Permissions beyond the scope of this license may be available at http://www.whoelsa.com. Peek at the personal perspective of a storytelling, MIT educated, PMP certified project manager. Change the way you look at the world, yourself, or at least your piece of toast by glancing through her posts. Pick up some tips while you're at it. What's the fuss all about?